She spoke about the UNESCO perspective on the international OER movement. The OER movement began in 1998 with the term ‘open content’ coined by David Wylie. In 2001, MIT Open Courseware became the first large OER project. She talked about Rice University Connexions intiatives that provide a response to the limitations of traditional textbooks and the University of the Western Cape Free Courseware Project. 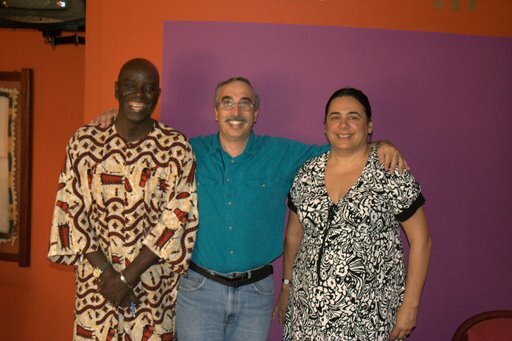 Health OER is a project between South Africa, Ghana and the University of Michigan dealing with Health education resources. Raising awareness through community building and network development are highest priorities. The AVU seeks collaborative partnerships for the creation, design and dissemination and utilization of OERs. Dr. Diallo stressed the importance of addressing the issues surrounding working in an African historical, philosophical, psychological and cultural context. AVU is establishing collaborative partnerships with MERLOT and the MERLOT African Network. There is a plan to release 73 AVU Math and Science modules as OER. I came all the way to Ghana to hear Vikram Savkar, the Publishing Director of Nature Publishing Group, who also happens to be the son of my dear colleague at NOVA, Reva Savkar, Professor of Chemistry at the Annandale Campus. He spoke about the importance of tertiary science education in Africa. Without access to current quality science research, it is a challenge to provide good education and build capacity. Among solutions to the challenges alluded to by all speakers were: Open (Me-learning) & print materials, centers of excellence and private and public partnerships. Vikram Savkar hasworks on the Nature Science Education library of searchable, reusable digital content, a community of teachers and learners who can collaborate online and tools to permit the community to interact with each other and the content. The key theme in all of these presentations today, including Vikram’s is partnerships- academic, industrial and government partnerships. Questions and Answers followed: What is the best opportunity to promote OER? Catriona Savage mentioned “talking about OER , telling the story of what works and what does not.” Gerry Hanley of MERLOT talked about “planning for action”. He encouraged the forum participants to have dialogues in their countries after experiencing MERLOT firsthand at the afternoon workshop. Dr. Diallo stressed the importance of addressing different needs and different perspectives. A question from the audience was about interpretation and translation needs of the OER movement as well as training material about how to effectively use ICTs for teaching and learning. How will we adapt materials for different cultures? Panelists all recognized the needs for multilingual solutions. Another question raised was about how we will keep track of quality in ICTs? Community built around the content, peer review and user comments, as in MERLOT, were all promoted as means of making decisions about quality. All speakers talked about the critical need for faculty development in the area of teaching well online. The participants were encouraged to join MERLOT and start making use of the free and open library. This afternoon, participants in the forum will attend our MERLOT hands-on workshop and get a chance to start to build their own personalcollections of learning objects.